GEOGRAPHY Brazil,Guyana,Venezuela,and Suriname.They live in humid woodland forest type habitat and are also found in open savannas. SIZE The brazilian rainbow boa averages 4-5 ft.Although large specimens may be 6' or 7' but not larger than this. CARE The brazilian rainbows are very sensitive to humidity and should be kept in a very humid environment 75% +.This can be accomplished by placing a large water bowl in the enclosure with a low wattage heat pad placed underneath.The cage should also reflect the need for high humidity and must facilitate this.Glass aquariums are not suitable because it is too hard to keep humidity high without a lot of work!Temperature should rest in the low 80 s with a basking spot in the middle 80 s.Temps should NOT go over 90 for this species so avoid high temps.Substrate can be astro turf,cork bark,bark,newspaper[although hard to keep humidity high] or some other moisture retaining litter.I would also suggest feeding your rainbow in another enclosure so they do not ingest any substrate.They do seem to like to climb so a branch or two may be added however it is not necessary.Small adults and juveniles can be housed in plastic tubs of appropriate size.This will help also to keep the humidity high.However the tubs seem to mold up and attract bugs when soiled so be sure that maintenace is impecable when keeping them in this way.Large adults may need a cage of around 3 or 4 foot long by 2 foot wide and about 2 foot high.This can also be used as a breeder enclosure so the two snakes have room to move and the male can pursue the female.These snakes seem to have a good temperament when raised from juveniles and can become very handlable and trustworthy although some may be a little nippy sometimes.Wild caught adults are usually nippy and will defend themselves by striking and biting however they are smaller snakes so it is not dangerous although they do have a good set of teeth!Again humidity is crucial and will need to be high to keep the snake shedding well and feeding well.They are a shy snake and a hide box is necessary for a happy healthy snake. FEEDING Juvenile rainbow boas are usually very good feeders.Usually accepting pink or fuzzy mice right after the first shed.They should be fed once every 4 or 5 days.Adults have smaller heads than alot of boids so they will usually feed on medium rats and should be fed only every 10 days as adults as they seem to be obese if fed too often.It may be wise to have your female a little over weight before cycling for breeding but this should not be overly done.Male over weight rainbows are usually lazy breeders. 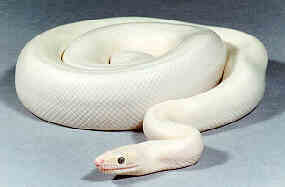 BREEDING This snake is now being bred in large numbers in the states and is regularly available.To breed the brazilian rainbow you first want to make sure that your animals are healthy and free from respiratory problems which sometimes are common in this snake.The female should be plump but not overly so and the male should have good body weight however not overweight.You may use a light cycle dropping from 12 hours on to 8 hours on.The night time temps should drop to between 70 and 72.The day time temps should be allowed to climb back in to the 80s to avoid respiratory problems.Typically you may see the female develop a mid body swelling if this is caught introduce the male immediately.Other wise one and a half months of cycling before introduction.Gravid females should have a basking spot of 90' other wise still born young may be common.She may lay on her side or belly up.Generally females carry their young for about four or five months before giving birth.The average clutch is 10-15 however litters of 20-30 have been reported.The juveniles are around 12"-16" in length and are well patterned but not colored.Like I said previous they usually feed well on pink or fuzzy mice after their first shed however some may need to be scented on lizards before feeding will occur.They are shy so a tight dark hide box should be given to juveniles and first meals should probably be tried at night when there is not a lot of movement going on around them.They do need to be handled regularly to become handlable however once they are they are usually a favored pet. INDEX-ADULT SIZE-4. HANDLING-3 or 4. HOUSING-3. FEEDING-3. NOTES I give a 4 on size because they are big enough to be impressive but are still very handlable and small.Handling is a 3-4 for captive raised specimens.Housing is a 3 because they do not need huge enclosures however some large adults may take up some space.Feeding is a 3 as long as the humidity is high and it is a captive raised specimen.Temperament is a 3 and not a 4 because even though they become very tame and handlable sometimes they may give you a nip! TOP PIC BY BRIAN SHARP, MIDDLE BY ROCKY COSTELLO.